Is your family in this lost home movie footage? 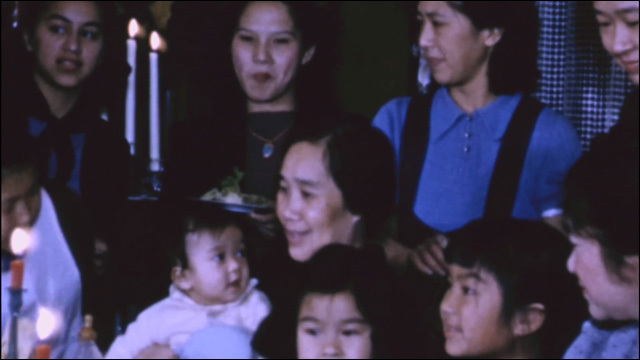 Help CAAM identify the Japanese American family, circa 1939 San Francisco, in this old home movie reel. The Center for Asian American Media's Memories to Light is a project to collect, digitize and share home movies -- and the stories they tell -- to a broad public. The footage is donated by friends and family looking to archive their home movies, but they occasionally acquire donated "orphan films" without any details associated with them -- no names, dates or locations written on the reels. CAAM is putting a call out to the community to help them identify the subjects in one of their recent acquisitions. The 16mm Kodachrome footage features a Japanese American family living in San Francisco in 1939. Do you recognize any of the people in this footage? Maybe it's your family! It's a mystery. One of the “orphan films” in our collection was brought to us by film preservationist Ron Merk. It features a Japanese American family living in San Francisco in 1939. Originally found on a reel of 16mm Kodachrome, Merk shared the footage with us, and we are now looking for the family featured in the video. The film begins with a panning shot of a large family, young and old, gathered in a living room, facing the camera and preparing to take a picture. The camera pans again and we see that there is much laughter and joy in this house. The film also features the family taking a walk together through the Elephant Towers on Treasure Island at the 1939-40 Golden Gate International Exposition, and there seems to be a large number of family members featured. Later, we see the family having Christmas dinner and opening presents together. There is also a part of the film that shows the main family shaking hands with a long line of people. Throughout the home movie, the recorder pans back and forth across their family to include as many people in the frame as possible. The film could have been misplaced or lost during the incarceration of Japanese Americans during World War II. There's so much history here. The folks at CAAM could use a nudge in the right direction. If you recognize any of the people in this film, let them know at memoriestolight@caamedia.org.